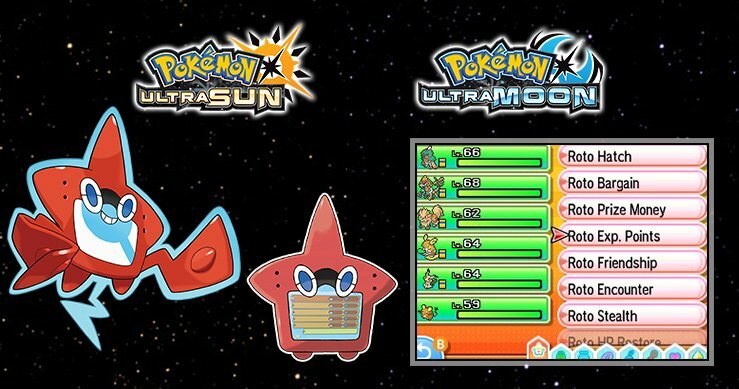 Following its early leak from CoroCoro Magazine, the latest news on Pokémon Ultra Sun & Ultra Moon have officially revealed, detailing two new Z-Moves and updated PokeDex features under their localized names. 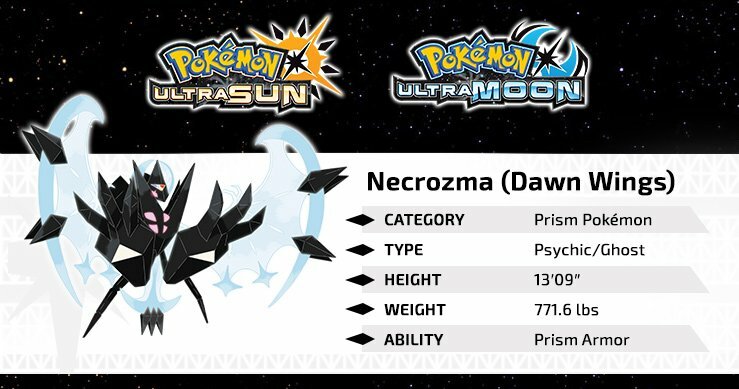 The Z-Moves for mascots Dusk Mane Necrozma/Solgaleo and Dawn Wings Necrozma/Lunala have been revealed for Ultra Sun and Ultra Moon. 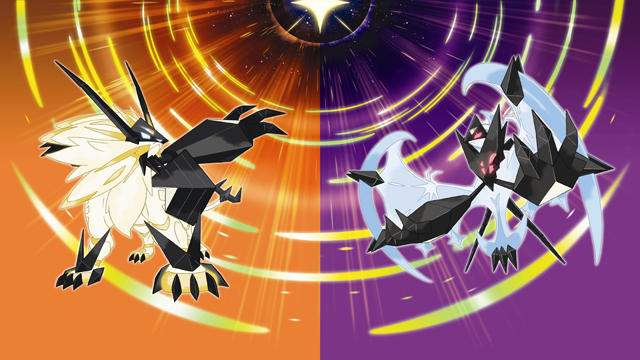 Solgaleo and its Necrozma form’s Sunsteel Strike will become Searing Sunraze Smash via the Solgaleo Z, while Lunala and its own Necrozma form turn Moongeist Beam into Menacing Moonraze Maelstrom with the Lunala Z. Both moves do damage while ignoring the target’s ability. 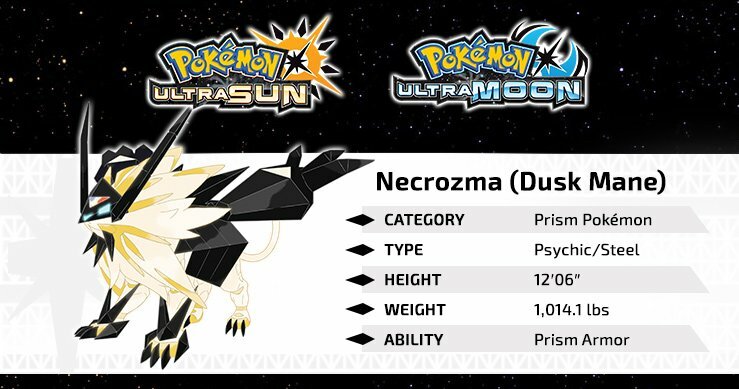 At its base form, Necrozma also has the new exclusive move Photon Geyser, and both of its new forms will have the Prism Armor ability. The Rotom Dex, the Alola Region’s Pokédex encyclopedia, is also receiving some welcome upgrades in the new games, including the Rotom Loto power that lets you use Z-Moves twice in battle, if you have “good compatibility” with your Rotom Dex. The Dex has more usage than in Sun and Moon, including “Rotom Power” which acts in the way of last gen’s O-Powers, such as earning more experience, asking questions, with the Dex unlocking more features the more you use it. In other Pokémon news, the latest in the multi-week Ash Pikachu giveaway, the Unova Pikachu, has begun and lasts until October October 16th. The Kalos and Alola Pikachu will follow for the two weeks after. A special Charizard continues to be given out at Target until October 14th and the mythical Ghost/Fighting type Marshadow is now available at GameStop through October 23rd, both Pokémon of which are available via serial codes. Keep in mind both of these will only work with copies of Pokémon Sun and Moon (the special Pikachu in particular is one per game). 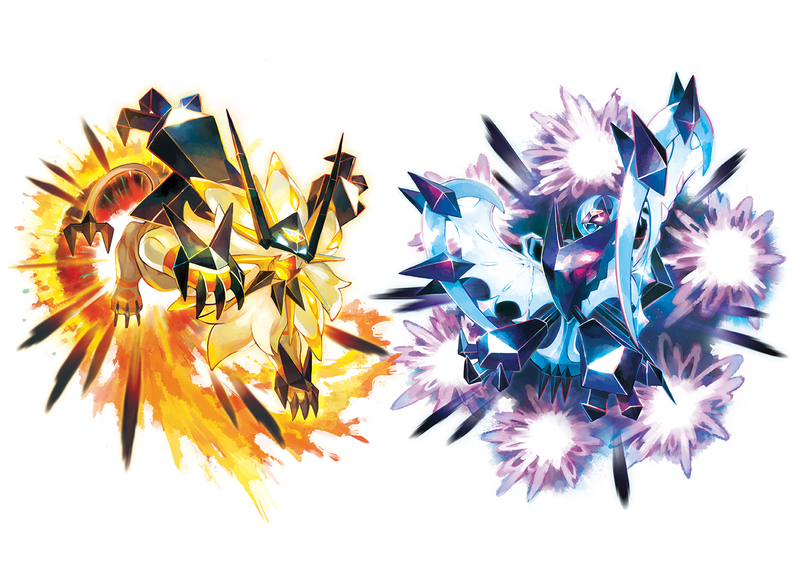 Pokémon Ultra Sun & Ultra Moon launches worldwide on November 17th for 3DS, and both are enhanced versions of last year’s Pokémon Sun & Moon, with new Ultra Beasts, Ride Pokémon, and much more.